See the lowly raised up! See the mighty play the fool! See children command grown-ups to dance! At Mardi Gras Madrigals, the least shall be the greatest and the greatest shall be the least! 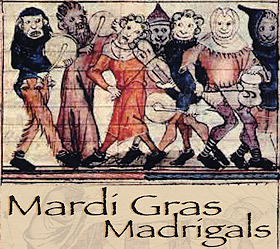 Mardi Gras Madrigals are a full medieval feast prepared according to medieval recipes (eaten without utensils, of course) to celebrate the midwinter carnival before Lent begins. At Augsburg, it features jugglers, storytellers, and period music performed by madrigal choirs from Mahtomedi and Saint Paul Central High Schools, and Augsburg’s own Cedar Sixteen men’s choir and Riverside Singers women’s choir. The feast takes place on Tuesday, Feb. 5, from 6:30 – 9 p.m. in Hoversten Chapel. Tickets are $20 and can be purchased through the Mardi Gras Madirgals web site. Augsburg students can attend free of charge, but space is limited and reservations are required. E-mail adamo@augsburg.edu to make your reservation. Visit the Mardi Gras Madirgals web site for more information about this evening of good food and family fun. All are welcome!